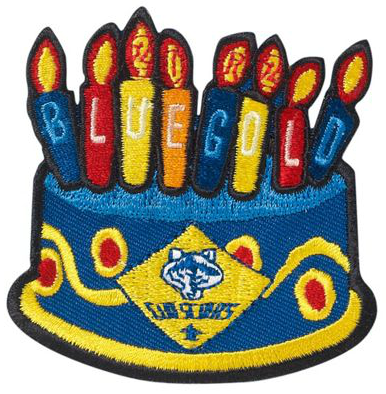 Come Celebrate the 107th birthday of Scouting at the Blue and Gold Banquet where we will have a ceremony for Webelos IIs who will receive their Arrow of Light Awards and bridge to their journey into Boy Scouts. A catered dinner and fun entertainment by For Goodness Snakes are provided at no cost to Pack 1776 members and their immediate family. Please RSVP by February 10th with the number of people attending and any vegetarian preference. Come Celebrate Scouting with Us! 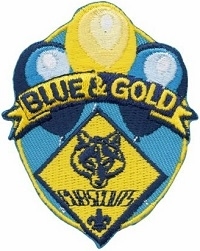 The Blue and Gold Banquet is where we celebrate the Birthday of the Cub Scout Program. 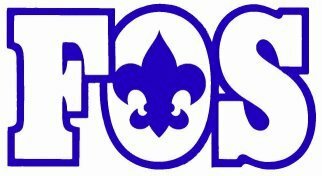 We will be celebrating the 106th birthday of Scouting and having a ceremony for Webelos IIs who will receive the Arrow of Light Award and "bridge" to their journey into Boy Scouts. A catered dinner and fun entertainment by magician Phil Ackerly, a 4-Time Gold Medal Winner, are provided at no charge to Pack 1776 members and their immediate family. Please RSVP by February 15th with the number of people attending and any vegetarian preference. We hope you had a great time at the Blue and Gold. A big thank you to the Dagen, Ghatta, Noble, Spears, and many other families for putting together a most wonderful event. During the hectic evening, a very inspiring and well-made video that Den Leader Scott Spears made of the Webelos II unfortunately did not get shown. The Arrow of Light video is now posted on our website. He did an exceptional job and we absolutely do not want his hard work to go unnoticed. We earnestly encourage you all to please watch it and tell Scott how much you appreciate his hard work ! The 2014-2015 video created by Grace capturing our Pack's activities had also been posted. Those of you who missed it will want to watch it as every den is featured. Also tell Grace how much you appreciate her efforts ! As always, photos and videos can be viewed and downloaded from the Pack's photo page. Remember to check it often as photos are posted throughout the year. 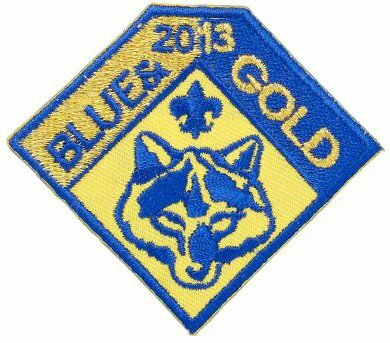 We invite you to the Blue & Gold Banquet where we will celebrate the 105th birthday of Scouting and send off our twelve Webelos II's to Boy Scouts! We will enjoy great food and fun entertainment by Astro Wizard! Admission is free to all scouts and their families but please RSVP by February 13th with the number of people attending and any vegetarian preference. See you at the big party! Thanks to Lisa, Jeff, John, and many others for putting together a most memorable Blue & Gold ! Congrats to all the Webelos graduates and best wishes on your Boy Scouting adventures ! The Arrow of Light video is now posted on SmugMug for your viewing pleasure. Save the date for our annual Blue & Gold Banquet where we'll be celebrating the 104th birthday of Scouting and send off our Webelos IIs to Boy Scout troops ! Blue stands for truth and spirituality, steadfast loyalty, the sky above. Gold stands for warm sunlight, good cheer, and happiness. 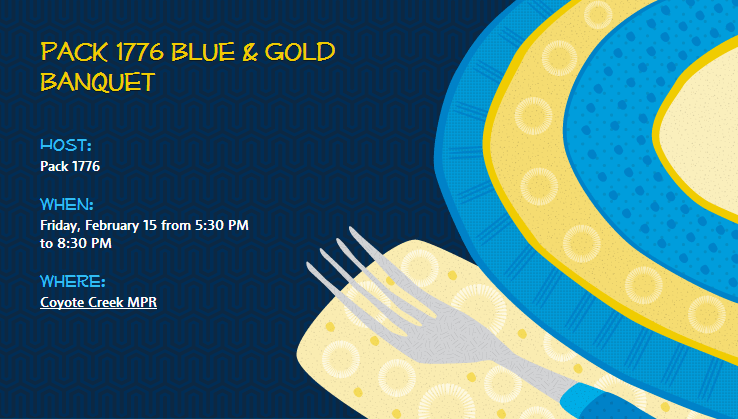 Blue And Gold Celebration – TOMORROW! Hi Pack 1776 Scouts and Families! 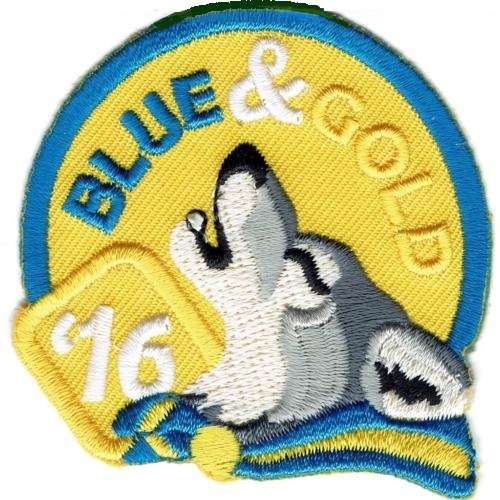 Just a friendly reminder that tomorrow is our big event, the Annual Blue and Gold dinner and farewell to our eleven hard working Webelos II scouts as they move on from 1776 Cub Scouts to Boys Scouts in the fantastic troops they have chosen, namely Troops 60,805 and 888. This will also be a chance to see you all before Den Leaders Ammy and Ada and I say goodbye to the most wonderful group of families and friends we have had the honor to work with. Pack 1776 is truly a unique, special group of boys and families, and I know will miss you all, leaving with a big hole in my heart for you, but a traveling down a new road with a huge suitcase full of priceless memories. 6:05 Greeting, commence dinner (no skit, short on time, maybe guitar), slide show while dining. 7:00 Arrow of Light Bridging ceremony, super achiever awards, bridge. 8:30 Clean up, out by 9:00. Yup, great dinner from A G Ferrari Foods, great entertainment with Python Ron, and great friends! Now don't forget to wear your snappy Class A uniforms. The Blue & Gold Banquet is just around the corner and we are getting ready to have some fun. We will be celebrating the 103rd birthday of Scouting and having a big send-off for our super-achieving Webelos IIs who will continue their Scouting journey in Boy Scouts troops. Besides dinner catered by A.G. Ferrari Foods (Mmm yum yum!) there will be entertainment by Python Ron's Reptile Kingdom. Admission is free, again, FREE!! !, to Scouts in good standing and their immediate family. But you MUST reply to this evite! Thank you and see you all at the big party!